Dennis Armfield could hold his head high after calling time on his AFL career. Dennis Armfield penned this emotional letter to Carlton members to announce his retirement. Carlton’s own cult figure Dennis Armfield has called time on his AFL career. Speedy veteran who has found his niche as a hard-working forward, keeping the opposition defence honest with his tackling and pressure. Booted three-goal bags against Geelong and Brisbane in Rounds 10-11 before suffering a ruptured testicle against St Kilda in Round 12. In his comeback game against the Crows in Round 16, he played a lone hand in attack, booting four of the Blues' seven goals, including three from outside 50m in the opening quarter. The fan favourite re-signed for one more season late last year and is a specialist skills coach for the Blues' women's team. 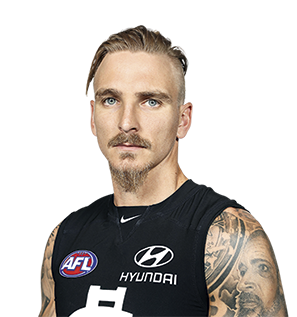 Draft history: 2007 NAB AFL Draft 3rd round selection (Carlton) No. 46 overall.